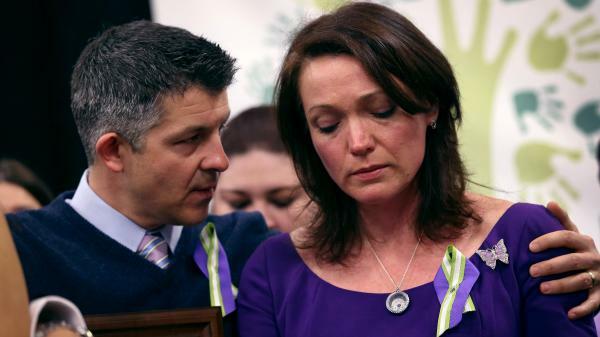 Ian and Nicole Hockley are parents of Dylan Hockley, one of 20 first-graders killed at Sandy Hook Elementary last year. Nicole helps lead Sandy Hook Promise, a nonprofit seeking to prevent the causes of gun violence. 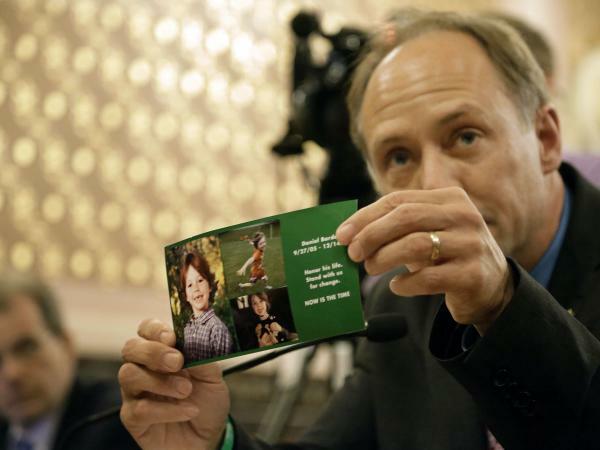 Mark Barden, whose son Daniel, 7, died in the Sandy Hook school shooting last year, testifies at an Illinois State Senate hearing on assault weapon legislation in May. Nicole Hockley says she used to be the kind of person who knew where she was going in life. Then, last Dec. 14, her 6-year-old son, Dylan, was one of the 26 victims killed by a gunman at Sandy Hook Elementary. "Every plan I had went out the window, and I just kind of lost my way in terms of where do you go from here, how do you pick yourself up and move forward and find a new path," Hockley says. The phone kept ringing at home, and media outlets sent flowers with cards asking for interviews. "In those early days and weeks, everyone wanted a piece of us like they wanted a piece of a lot of the families, and it was hard to know who to trust," she says. A friend told her about some people from the community who wanted to help. Rob Cox was one member of the group, which later became known as Sandy Hook Promise. Ultimate Frisbee has been happening Tuesday nights in Newtown, Conn., for years. None of the Frisbee players were parents of victims, but several of them had kids in the school at the time. And it's a small town. The school was close to everyone. "The day after, that Saturday morning, a whole group of us, family, friends, dogs, everyone, we went for a hike, and we cried, we hugged each other and we tried to answer the unanswerable," Cox says. People said they felt like they needed to do something. As they started meeting, figuring out what to do was the challenge. "Some people wanted like a local munitions ordinance; I mean, it was all over the place," Cox says. "But what was actually quite apparent, particularly when you look in hindsight on this, is just that everybody was kind of right in a way. There is no one solution." And that became the idea behind Sandy Hook Promise. The goal wasn't to focus on a single answer, but to approach the issues surrounding what happened more broadly. Hockley says gun violence is a public safety issue. "Thirty-two thousand deaths a year, 500,000 acts of violence that include a gun. That's unacceptable," Hockley says. "You have that level of death or injury from any other area of life, you do something about it." Hockley is now Sandy Hook Promise's paid communications director. After the new year, as part of a campaign organizers are calling Parent Together, they plan to launch online tools to address some of the mental health issues believed to be related to what happened in Sandy Hook, like reaching out to isolated kids and working with children with emotional detachments. One program will focus on getting pediatricians to focus on children's mental wellness. Sandy Hook Promise raised about $3 million from donors this year to fund its operations. Each victim family is dealing with what happened in its own way. Some have worked behind the scenes with Sandy Hook Promise. About seven families are publicly involved. Mark Barden lost his son Daniel and also now works for the group. "We're in the middle of the most profoundly deep sorrow we've ever known," Barden says. "And so this is hard work anyway. But to do it under those circumstances, it's just exponentially harder." And yet, he says, he feels driven to do it. He says Sandy Hook Promise is not an anti-gun group. "We like to think of it as gun responsibility, gun safety, because most gun owners are responsible gun owners," Barden says. He says the group can get more done if gun owners are part of the conversation. For Hockley, fostering that kind of conversation has been therapeutic. "Every once in a while I say, 'Why on earth am I doing this? I could just be home.' But then, what would I be doing at home? This is my way of honoring Dylan, and in some respects keeping him alive," she says. Barden says because the group's goal is long term and not really about passing laws, the last year wasn't as disappointing as it's been for other groups with specific legislative agendas. He says despite all the members' work, he knows they'll never stop all gun violence in the country. "But if you look at campaigns like designated driver or some of the smoking campaigns that reduced those numbers by 80 percent over a 10-year period or a 20-year period — if we could achieve something like that, I would say, that would be success to me," Barden says. It's a success he says has to happen, to keep more families from experiencing the pain he and his family have had to endure for the last year. Copyright 2013 WSHU Public Radio Group. To see more, visit http://www.wshu.org/.